Brian Samuel Dixon (born April 26, 1990) is an American football cornerback for the New Orleans Saints of the National Football League (NFL). He played college football at Northwest Missouri State. 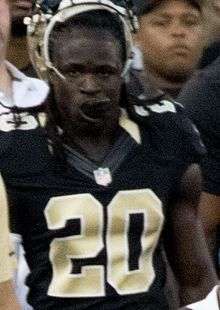 Dixon signed with the New Orleans Saints as an undrafted free agent in 2014. Dixon played college football at Joliet Junior College then later transferred to Northwest Missouri State. Dixon had 30 tackles and five interceptions in his Junior season at Northwest Missouri State. Dixon Had 21 tackles, 6 passes defensed, one interception and two forced fumbles while he and his twin brother Brandon both starters help lead the Northwest Missouri State football team to win the 2013 NCAA Division II Football Championship in his senior season. On May 12, 2014, Dixon was signed by the New Orleans Saints as undrafted free agent. On November 5, 2015, the Saints signed Brian's twin brother Brandon Dixon to their practice squad. This made them the only set of twins to play on the same team since the AFL-NFL merger and the first since 1926. They are the twelfth set of twins to play in the NFL and along with the Pounceys and the McCourtys, are the third active set of twins currently playing in the NFL. On September 3, 2016, he was waived by the Saints. He was then signed to the Saints' practice squad. He was promoted to the active roster on October 1, 2016. He was released and re-signed to the practice squad on October 10. He was promoted to the active roster on October 13, 2016. He was released by the Saints on November 9, 2016 and was re-signed to the practice squad. Dixon's twin brother, Brandon, was drafted by the New York Jets in the sixth round, (195th overall) of the 2014 NFL Draft. 1 2 3 "Saints Roster Countdown 2014: #44 Brian Dixon and #94 Cameron Jordan". canalstreetchronicles.com. Retrieved July 25, 2014. ↑ "Saints announce list of 17 undrafted rookies". espn.com. Retrieved May 12, 2014. ↑ Ted Lewis. "Saints are twinning with the Dixon brothers". The Advocate. Retrieved July 2, 2016. ↑ "Saints Release OT Khalif Barnes, Promote DB Brian Dixon". ↑ "New Orleans Saints announce roster moves". NewOrleansSaints.com. November 9, 2016. ↑ "Twin brothers Brian, Brandon Dixon finally apart as they join Rob, Rex Ryan with New Orleans Saints, New York Jets". nola.com. Retrieved May 18, 2014.